It is difficult to find people who haven’t dealt with problem of overeating. Before you start considering overeating as a problem, you must understand how overeating effects your body and the steps you can take to prevent overeating. Occasional overeating at social gatherings may not adversely affect your body. For instance, if you go to an office party and are unable to control your temptation to eat delicious food it may not adversely affect your body. If you overeat occasionally, you can take steps to control the temporary side effects of overeating. However, if you overeat regularly it can damage your body in the long run. Weight gain and additional fat deposit caused due to overeating can cause long-term weight gain. Studies have shown that most people overeat because of a chemical compound called Dopamine. This chemical which is found in the human brain, induces a feeling of happiness when we eat. However, when we overeat the dopamine levels in the brain get depleted. When the dopamine levels get depleted, a person will have to eat more food to get a feeling of satisfaction. However, overeating regularly can cause real damage in the long run. You gain extra calories and additional fat gets deposit in the body. Recent studies show that even one-month of overeating can lead to long-term weight gain. To understand the impact of overeating on stomach, you must first understand how the stomach processes the food you eat. The food we eat gets stored in the upper part of the stomach which slowly gets transferred to the lower part of stomach for digestion. The strong muscles of stomach mash the food we eat and push it to small intestine. When we overeat, the muscles in the stomach get stretched and ballooned up. If we overeat occasionally, we experience discomfort when the stomach muscles stretches. However, when we overeat regularly, we get used to this expansion and contraction of stomach muscles and no longer experience discomfort. Another problem that people face when they overeat is that the digestive enzymes are available in limited quantity and they take time to digest bulk food. This can slow down the digestive process and the food we eat remains in the stomach for longer duration. This fullness of the stomach can sometimes cause discomfort, pain and misery. What happens if stomach is not able to hold food? The chances of stomach getting ruptured are rare, so the food is most likely to go back up in the esophagus or down into the small intestine. When the food goes up it comes out of the system through vomiting. 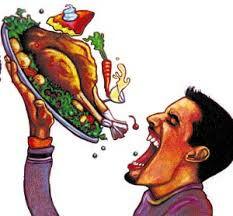 Vomiting is also not common because when we overeat the brain sends strong signals to stop us from overeating. Also, people don’t vomit after they overeat is because the stomach muscles get so stretched and weak after overeating that it cannot vomit the excess food. So the food you eat usually remains in your stomach and affect other parts of the body. When a person overeats, the stomach muscle gets overstretched and it starts moving towards the lungs and diaphragm. After a large meal, the stomach muscles can expand up to 3 times its normal size which can make it difficult for a person to breathe until the stomach returns to its normal size. When you overeat not all food you eat does not make it to the stomach immediately. This could bring the food back up in the throat which can cause frequent burping and nausea. When a person overeats, it becomes difficult for the valve on the top of the stomach to close. This could allow the digestive fluids in the stomach to be pushed back up into the throat which can cause an acidic reaction. Acid reflux can cause severe discomfort and if it continues on a regular basis, it could damage the delicate tissue lining of the throat. At times, the damaged tissue lining could lead to throat cancer. When a person overeats, the body has to spend more energy to digest the food. Also, the intestine and the stomach will have to work harder to distribute all the nutrients they have received. This leads to an energy drain and you start yawning and feel sleepy.